It seems Turkey’s generals, so long a force in the country’s politics, are going out with a whimper, not a bang. Initially, some media outlets dubbed the surprise resignations of Turkey’s top generals on July 29 as an “earthquake” and “bombshell.” But by August 1, the country appeared to shrug off the military maneuver and move on: financial markets held steady and the government, led by the Justice and Development Party (AKP), remained unfazed. In his farewell message, the outgoing chief of the General Staff, Isik Kosaner, complained that it had become ‘impossible to continue serving’ due to the ongoing detention of some 250 retired and active-duty military officers on suspicion of being conspirators in coup plots, known as Ergenekon and Sledgehammer. In addition to the chief of staff, the commanders of the army, navy and air force also tendered their resignations. Prime Minister Recep Tayyip Erdogan, who has fought for eight years to curtail the political influence of the military, offered no response to the resignations other than to name Gen. Necdet Ozel to serve as the new head of land forces and acting deputy chief of the general staff. Styling itself as a bulwark of the secular political system created by Mustafa Kemal Ataturk, founder of the Turkish Republic, the military has overthrown four elected governments since 1960. The resignations came on the eve of the twice-yearly meeting of Turkey’s Supreme Military Council (YAS), which decides on military appointments and promotions. A four- day session of the YAS started August 1. Whereas in previous years recommendations put forward by the military tended to gain rubber-stamp approval from the government, last August a standoff developed after Erdogan refused to endorse key appointments. According to Turkish media reports, Kosaner’s resignation came amid a series of tense meetings in which Erdogan again refused to endorse promotions suggested by the military. Soli Ozel, a political analyst at Istanbul’s Bilgi University (and no relation to the acting military chief), believes the episode serves to draw a line under discussion over the military’s influence over Turkish politics. “They have not been able to hold political influence for some time now, so who cares if they resign? Period, end of story,” Ozel told Eurasianet.org. However Gareth Jenkins, a military analyst with close contacts to the Turkish military, believes the underlying reason for the resignations - the arrest and detention of military officers - could risk provoking an operational crisis in the military. The officer corps is growing disillusioned, Jenkins contended. “Military officers are very reluctant to communicate with one another as there is a fear that it will be intercepted, distorted and used against them,” he said. The coup plots have been a source of deepening controversy in Turkey. Inconsistencies in evidence presented against some alleged military conspirators have caused some Turks to claim the prosecutions are politically motivated. 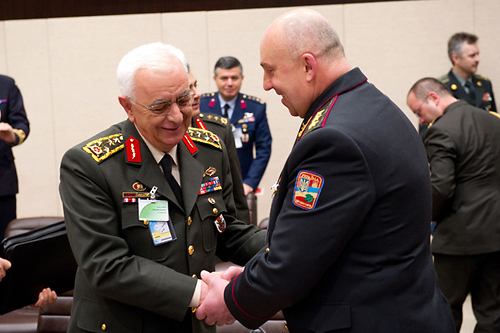 The new acting military chief, Gen. Ozel, is widely seen as on friendly terms with AKP leaders. Even so, Jenkins disputed the notion that Ozel would become a “yes-man” to Erdogan. "It will take around 10 years before officers placed in the ranks by the AKP and its supporters will become senior enough to reach the top posts." Alexander Christie-Miller is a freelance journalist based in Istanbul, where he writes for the Times.